The United Nations designated every 31st of October as World Cities Day to promote the international community’s interest in global urbanization, and to push forward cooperation among countries in contributing to sustainable urban development around the world. World Cities Day marks the end of Urban October month of celebrations, events and activities that took place all over the world. This year, the World Cities Day was celebrated under the theme Inclusive Cities, Shared Development in line with the implementation of the outcome document of the Habitat III Conference—the New Urban Agenda—that promotes the concept of “cities for all” and emphasizes the importance of social inclusion in cites to make urbanization a driving force of global development. 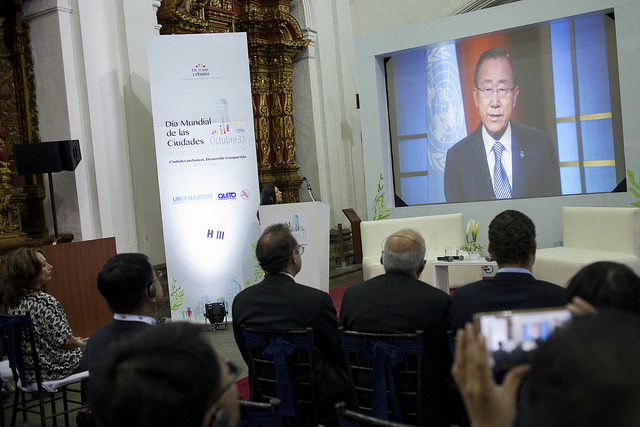 Coming only few days after the Habitat III Conference, the Global Observance of World Cities Day 2016 took place in Quito, Ecuador, in the historic scenario of the City Museum. The event organized by UN-Habitat, the City of Quito and the Shanghai Municipal People’s Government offered an opportunity for both local and international stakeholders to discuss instruments to effectively put into action the New Urban Agenda. After listening the UN Secretary-General message , the session was opened by Mr.Bai Tinghui, Director of Shanghai Water Authority, representing the Vice Mayor of Shanghai, who shared China’s best practices on sustainable urbanization and transformative urban development in line with the Quito Declaration principles. The Mayor of Quito, Mauricio Rodas, highlighted the commitment of Quito as Habitat III hosting-city in being pioneer in implementing the New Urban Agenda with a long term urban plan that will enhance the public transportation, urban security, and city’s environment. The session also counted with the participation of Zhang Bing, Julio Echeverria and David Gouverneur as key note speakers of the roundtable Urban Talk on inclusive cities and informal settlements planning. In New York, there was held an Urban Breakfast to discuss the Day’s theme. At noon, the Secretary-General of the Habitat III Conference, Dr Clos, presented the New Urban Agenda in a media briefing. In China, The Ministry of Housing and Urban-Rural Development of the People’s Republic of China (MOHURD), in collaboration with UN-Habitat and Fujian Provincial Government, held an event with a special focus on global sustainable urbanization in Xiamen. Furthermore, in Shanghai, it was organized a Forum on Urban Culture and Quality of City Life by the Shanghai Municipal Bureau of Planning and Land Resources. In Europe, there was an Urban Walk in Geneva to discover proper lighting for welcoming, inclusive and safe urban public spaces. Also, in Warwick, United Kingdom, the Sustainable Cities GRP held an event to showcase cities research. And there was a Canaries Urban Dialogue in Gesplansa, Spain. Finally, among many other initiatives, the Tehran Municipality organized the Tehran Golden Adobe Global Award for the Top Urban Management Projects to value local governments and urban management. Thank you to everyone who celebrated the World Cities Day 2016 and contributed to address the challenges and opportunities of the implementation of the New Urban Agenda for the global sustainable development.